I'm Andy Miira, game developer (mostly experienced with Unity) and otaku gamer (and anime lover, all that stuff xD). It's my first time creating this kind of development thread, hope this can exercise my writing skills too! I'm developing the game using Unity (by Unity Technologies), it's the game engine I'm most experienced and confortable with. - Kinematic Character Controller (by Philippe St-Amand), in my opinion, it's the best 3D Character Controller ever made for Unity. You NEED to study the example project and walkthrough course included, but it's really worth it! I'll frequently shorten it's name to KCC. - Fungus (by Fungus Games), the best narrative/storytelling asset for Unity that I ever used! - ProBuilder and ProGrids (by ProCore 3D, Unity Technologies), to speed up level prototyping and have accurate object placement on the 3D scenes. - Cinemachine (by Cinemachine Imagery Inc, Unity Technologies), to facilitate camera implementation for the game. It's a HUGE timesaver for both 2D and 3D games! 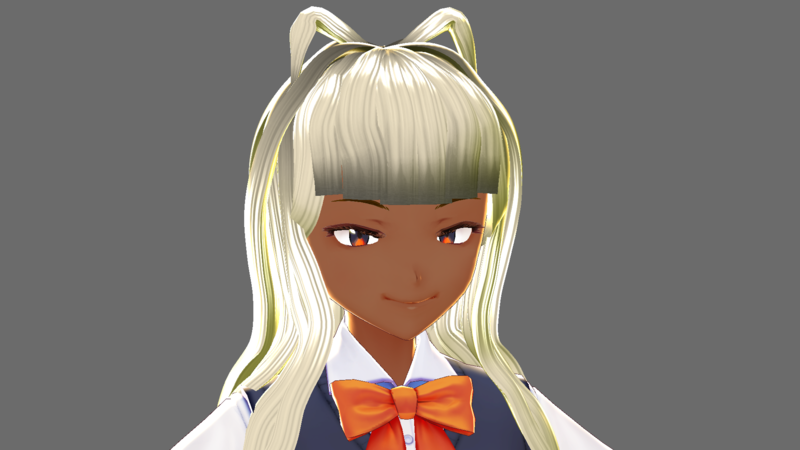 Another essential resource that I'll use, is the software VRoid Studio (by pixiv), to quickly create custom 3D anime character models. 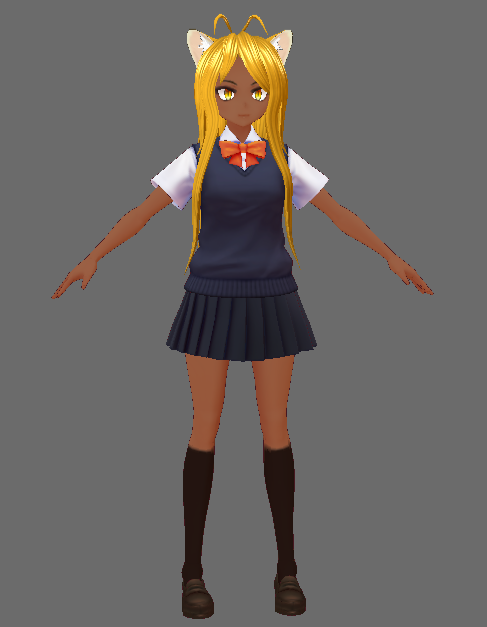 And also Blender (by Blender Foundation), to fine tune and add some details to the characters. About music and sound effects, I'll probably add sounds from some SFX Packs I bought from the Asset Store, and try to compose a few tunes myself (if I have enough time for that xD). But for now, my priority is to implement the core gameplay of the game, based on KCC's foundation. For now, I made a simple test level to test the character movement and all that stuff. And I tweaked some basic gameplay scripts based on the Kinematic Character Controller asset's examples. A world where humans and many "human-like" creatures used to coexist together. A wounded world, broken in pieces. The girls have cat ears. They love each other dearly. This is the dream he always wakes from... Alone. The Linkage Stream System. Commonly known as RINGStream. It was a magnificent invention capable of physically joining different realms together. Many alliances and bonds were created after people started using it. Many lives were born thanks to the RINGStream's existence. The people born in each realm suddenly woke up in their original land of birth. Many bonds were broken on that day. The RINGStream was no more. A man named Shiki once again awakens from his dream... But this time, he's not alone. Two girls with cat ears barge into his room, and admonish him. The sly and brash Natsuki. And her sister, the serious and hardworking Akimi. Somehow, the RINGStream was active again. The girls tell him that many little kitties from their own realm escaped to the human lands. The kitties are really causing a mess. So, they need his help to catch the runaway kitties and bring them back to their home. The man doesn't know who those girls are. He is hesitant. But he reluctantly agrees to their request. And so, their adventure begins. I'm quite late to make a progress report, hehe... So here goes! In the last few days I made some progress with the game (now called "Nekosuki!") prototype. - I adjusted the main 3rd Person Camera of the game. Using Cinemachine, I added a "Manual Camera" mode, a camera that only moves when the user moves the mouse or the Right Analog Stick. - Today, I made various adjustments to the basic movement of the character (run speed, jump height, character turning, etc...), and I also added an "Active Camera" mode, that follows behind your character and rotates the camera when you move sideways. 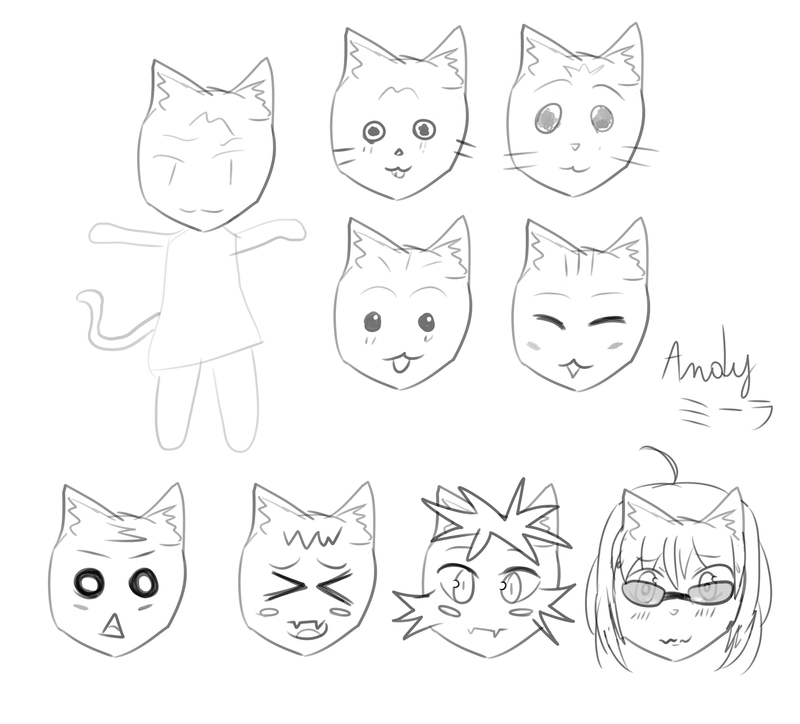 - My next step is to actually create the character's animation states, and make the basic animations play in-game. 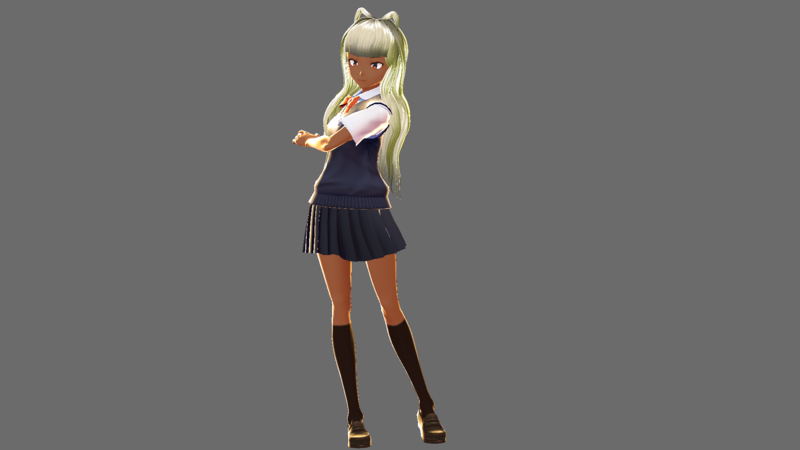 I'll update and better customize her design later, but for now I'll prioritize programming the gameplay. I've been sidetracked by some other things that made me busy. But my main goal during this jam was to, at least, make a game prototype that I can continue developing after the jam. And to research tools and assets that could help me develop the game faster and avoiding "reinventing the wheel". Well, I'll focus on that for now. I did research and test an open source Finite State Machine (FSM) framework, that will help me a lot to program the AI and to better organize my code. I didn't complete any playable prototype during the jam's duration, but I can say that during this month I made some important steps in finally starting this personal project, even if my game's development progress is still at the very beginning. I gathered useful resources and learned many things that I feel sharpened my coding skills. I'm very grateful for the extra motivation this jam gave me. Quick update: I'm currently working on a Ledge Grabbing system for the game. I'm still working on the Ledge Grabbing system I mentioned in my last post. Actually, last month (March) I had paused this task to make some fine adjustments to the game's character controller and camera. I had quite a progress with them! I worked a bit more in her hair and eyes. 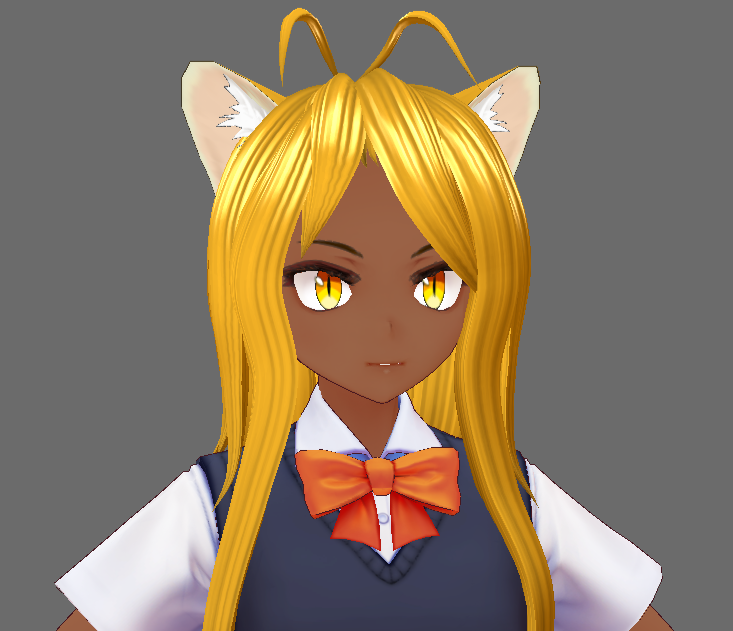 For the cat ears, I used the Nekomimi Sample by 鮪缶.